Summary: Process design provides decision makers with snapshots of how systems currently work and where they could be improved. Definition: What is a Business Process? We write the process narratives in Word. In simple terms, business process design is a way of gathering related, structured activities (tasks) that serve a particular goal, usually for customer though it can also be for an IT system. The best way I’ve found to capture the business process is in flowcharts, which show the sequence of activities and where each task inter-relates. I’ve learnt so much how business models work by taking a business apart, process by process, and seeing where it’s working best and where it needs some fine-tuning. One definition of a business process is that it’s a ‘set of coordinated tasks and activities that will lead to accomplishing a specific organizational goal’ TechTarget’s Definition of Business Process. In addition, business process management (BPM) is a systematic approach to improving those processes. The Business Process Management Initiative (BPMI) promotes the standardization of common business processes, as a means of furthering e-business and business-to-business (B2B) development. To realize end, it developed the Business Process Modeling Language (BPML), an Extensible Markup Language (XML)-based meta-language for modeling business processes. A business process diagram let’s you illustrate activities that are designed to produce specific outputs. For example, if you worked for a bank, you might have a Credit Card application process.That shows what the customer needs to give in, what happens when the application is received, and what results are expected. The customer gets a new credit card or is rejected. You need to design processes for each these scenarios. Let’s look at an example of creating a process flow diagram for a Credit Card application. Like we said, business processes show how to capture (record) the order in which activities occur. The customer is rejected online. The customer is rejected at branch. The customer is rejected at sub-branch. All of these scenarios need to be mapped correctly and, if necessary, form part of a new process. For example, the credit card rejection process. As a Business Analyst, you need to design business processes for each these scenarios. Start – what triggers the process into action? I want a credit card. Middle – what goes on in the process? The different steps, including variations, business rules, and possible exceptions. End – what conditions are necessary to close the process? I got my plastic friend! Business process modeling involves designing processes that add value by showing the transformation of inputs into useful outputs. What inputs go into the Business Process? Inputs are whatever enters something into the process, for example, the customer (a human resource) submits a credit card application. In another process, a HR system (equipment) may submit a report to anther IT system, maybe the SAP or Oracle databases. Inputs can be resources (people), materials, energy, and equipment (software). In UML, a resource is an input to a business process and is consumed during the processing. For example, as each daily train service is run, the service resource is ‘used up’ as far as the process of recording actual train times is concerned. 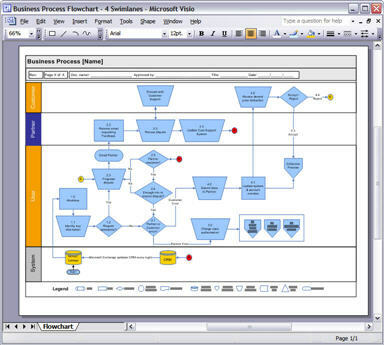 When mapping business processes, an Input link indicates that the resource is consumed in the processing procedure. For example, when customer orders are processed they are signed off and used only once per order. What are Business Process Analysis outputs? Outputs are the result, the end product, in the business cycle. Outputs may be a physical product (possibly used as an input to another process) or a service. Outputs are whatever is produced as a result of this action. While this seems obvious, remember that in complexes there may be two or more outputs. You need to decide which is the main output and relegate other outputs to sub-processes. More on sub-processes later. As a Business Analyst, this means that in the credit card application, the outputs will be the Acceptance of the Credit Card request or a Rejection of the request. When designing the process map, make sure you cover all scenarios so the process flow and all intermediate activities are mapped. A business process will typically produce one or more outputs to the business, either for internal use of to satisfy external requirements. Outputs may be a physical object (such as a report), a transformation of raw resources into a new arrangement (a daily schedule) or a business result such as completing a customer order. Remember, business process A’s output may feed into business processes B, either as a requested item or a trigger to start new activities. Next week, I’ll look at how to use Business Process design techniques for large Software Development projects. You might want to read this if you’re looking at ways to improve your department’s performance, outsource projects, or to improve your knowledge of process design. Do you enjoy process design or designing flowcharts?